In his ever-desperate attempt to appear relatable to the American audiences he so often lies to, Israeli Prime Minister Benjamin Netanyahu often employs puns. Yes, puns. 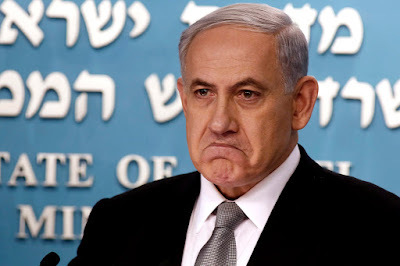 Yesterday, in a live webcast directed at persuading a Jewish American audience to oppose the Iran deal, Netanyahu employed one of his favorite punchlines for the benefit of the Borscht Belters watching: Iran, he said, wants to "have its yellowcake and eat it too." Get it? Because "have your cake and eat it too" is a popular English-language idiom and "yellowcake" is milled uranium oxide, material converted from its raw state into a form prepared for enrichment. So clever. But, like most things Netanyahu does, it's not a particularly original line. Fulminating about the deal to CBS Evening News' Scott Pelley the day after it was announced, Netanyahu said on July 15 that the agreement would give "the preeminent terrorist state of our time access to nuclear technology that they will ultimately turn into an arsenal of nuclear weapons and hundreds of billions of dollars to finance their terror machine." Hyperbolic enough? "Don't let them have their yellowcake and eat it too," Netanyahu warned. Back in October 2013, Netanyahu used the same line during his furious rant before the United Nations General Assembly. "Ahmadinejad was a wolf in wolf's clothing. Rouhani is a wolf in sheep's clothing," Netanyahu declared, recycling yet another line he had been trotting around for months. Deriding the renewed effort, following Rouhani's August inauguration, to end the diplomatic impasse over Iran's nuclear program, Netanyahu huffed, "Rouhani thinks he can have his yellowcake and eat it too." Hey, when you've got a humdinger like that, it makes sense to repeat it. But here's the thing: it's not even Netanyahu's own line. He stole it from David Harris, the Israel-Right-or-Wrong executive director of the American Jewish Committee, who titled a propaganda-laden oped for The Jerusalem Post and Huffington Post in 2010, "Iran: we can have our (yellow) cake and eat it, too." From stealing Palestinian land to stealing snappy one-liners from Israel lobbyists?